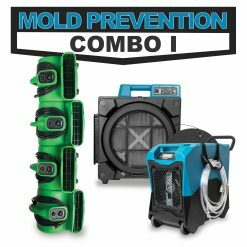 MOLDXGONE is a do it yourself solution designed to prevent mold, water damage and dry rooms faster. Water Damage Restoration companies like SERVPRO and 911 Restoration have been using this type of equipment for years. By doing it yourself, you can take care of water damage immediately without wasting precious time by having to wait for insurance companies or waiting for someone to come to you. You will save money by not having to pay deductibles and higher insurance premiums. 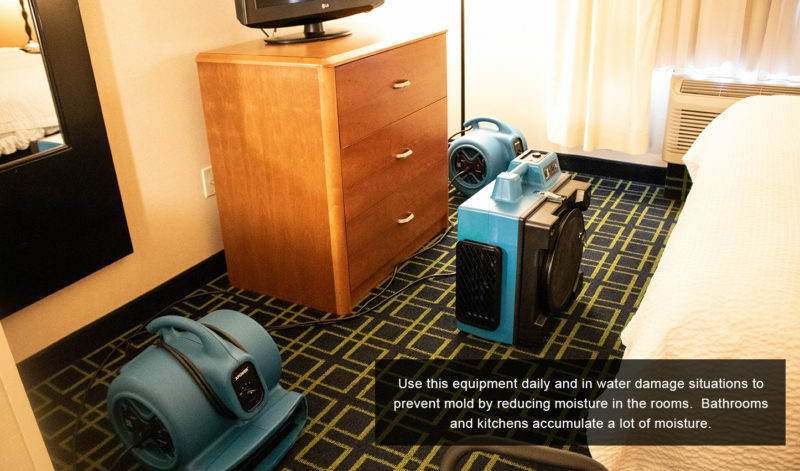 In the long run you will save money by having the right equipment so that you do not have to pay for expensive mold removal services and replace costly items due to water damage. Moisture is your number one enemy when it comes to Mold and Water Damage. You need to clean and dry any damp materials within 24-48 hours to prevent mold growth. Moisture is your number one enemy when it comes to Mold and Water Damage.You need to clean and dry any damp or wet building materials and furnishings within 24-48 hours to prevent mold growth. Xtreme Dry creates a desert like environment. The XPOWER LGR Dehumidifier drops the relative humidity below 25%. This is important because this dry environment speeds up the evaporation process and drys hard to reach places like walls, ceilings and subfloors. 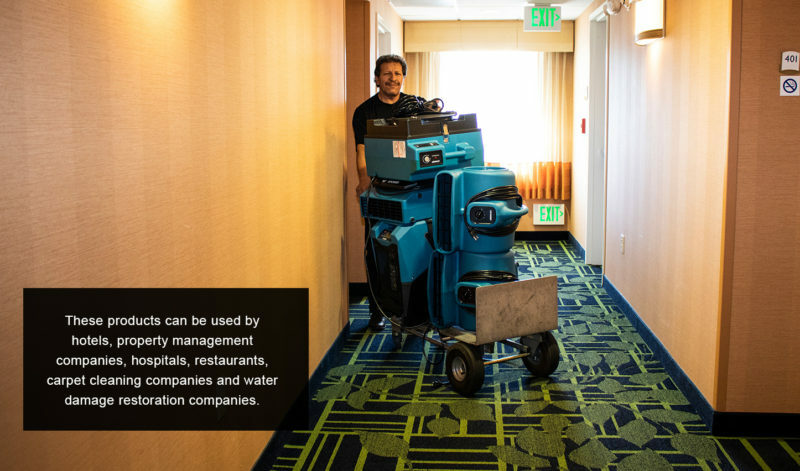 These products can be used by hotels, property management companies, hospitals, restaurants, carpet cleaning companies and water damage restoration companies. Mitigation procedures should begin as soon as safely possible. When rooms and items are exposed to water and water vapor for extended periods, moisture penetrates into them more deeply. The more water they absorb, the more time, effort and expense is required to dry them. 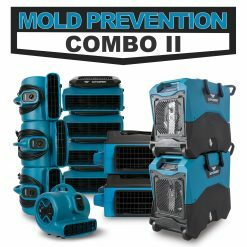 Use this equipment daily and in water damage situations to prevent mold by reducing moisture in the rooms. Places like bathrooms, kitchens, basements, garages and HVAC systems accumulate a lot of moisture so these places are prone to mold. Before restoration begins, the source of moisture intrusion should be located and eliminated. Use the categories listed below to determine the type of water loss you have encountered. Determine if you can do it yourself or if you need to call a professional. Category 2 water contains significant contamination and has the potential to cause discomfort or sickness if contacted or consumed by humans. Category 3 water is grossly contaminated and can contain pathogenic, toxigenic or other harmful agents and can cause significant adverse reactions to humans if contacted or consumed. Remove excess water, absorb, drain, pump, or vacuum-extract. Effective extraction is a critical component of efficient structural drying since water that is not physically removed from the structure will need to be removed by evaporation, a much slower, costlier, and more energy-intensive process. Materials that are not restorable or that pose a safety hazard should be removed as soon as possible. This way unnecessary moisture is removed accelerating drying times. Items can be, but are not limited to: bedding, furniture, throw rugs, etc. 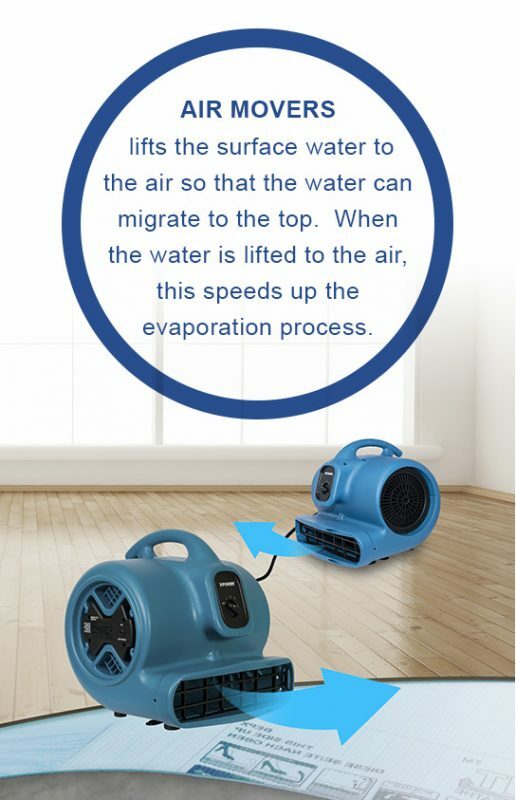 Air movers should be used to provide continuous airflow across all affected wet surfaces. 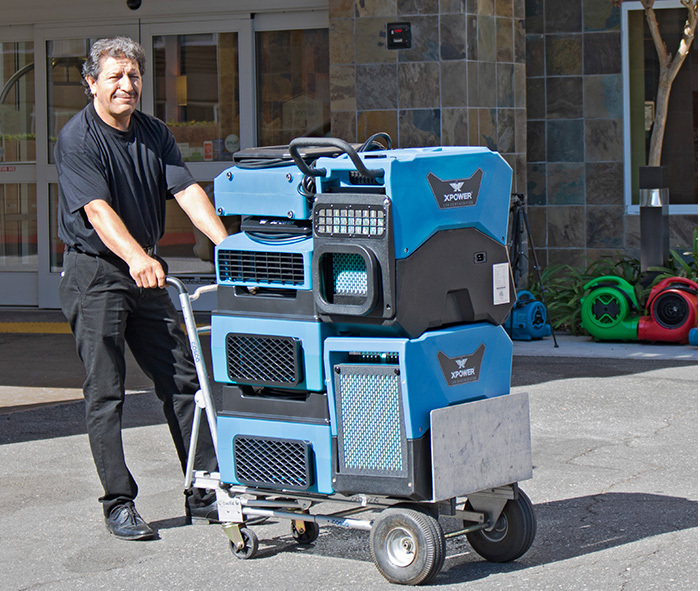 Typically 4 air movers per dehumidifier. 6. If possible, ensure that air movers are creating a cyclone effect and not pushing air against each other. 7. Account for obstructions (eg. Furniture and equipment),if their presence prevents airflow across the affected area, adjust and continue. 8. Read manual for safety procedures and follow all warnings and safety precautions prior to use. 9. Axial fans with 360° rotation can be placed in the center of the room aimed at ceilings and centrifugal fans with 3 positions 0° ,45° and 90° can be placed against the wall blowing upwards. 1. 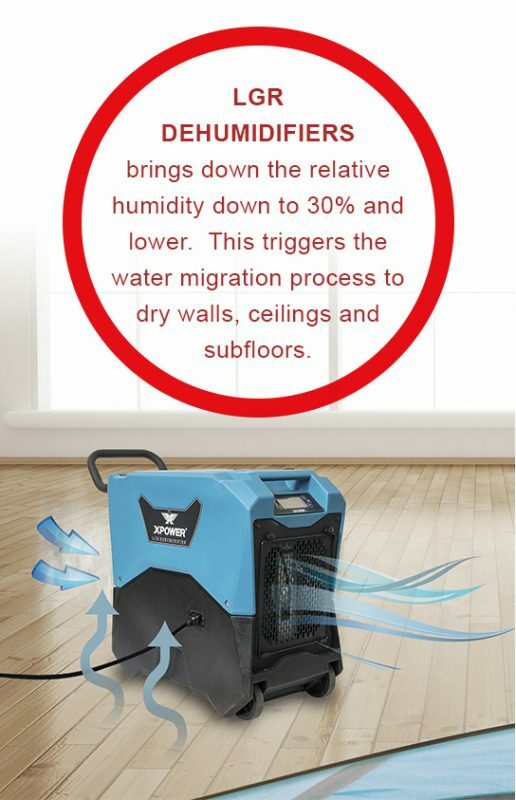 Xpower XD-85LH LGR dehumidifier separates the moisture from the air in the affected area and returns dry air at a rate of 85 pints per day(at AHAM) with sufficient airflow. AHAM is the abbreviation for Association of Home Appliance Manufacturers, which is the company that established the testing conditions. AHAM rating refers to “average conditions” which means the temperature is 80° Fahrenheit and the humidity level is 60%. 2. 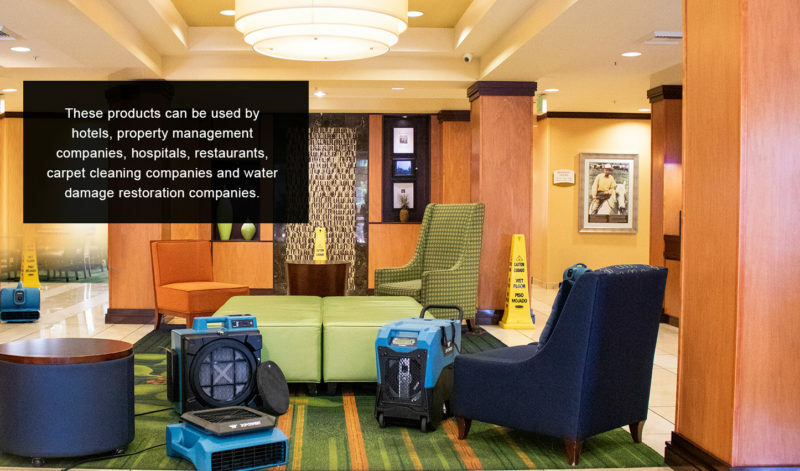 LGR dehumidifiers are typically placed in the center of the room with the return air in the same direction as the air movers. 3. Attach clear drain hose provided to the unit with opposite end in a drain like bathtub or sink. 6. Read manual for safety procedures and follow all warnings and safety precautions prior to use. 7. 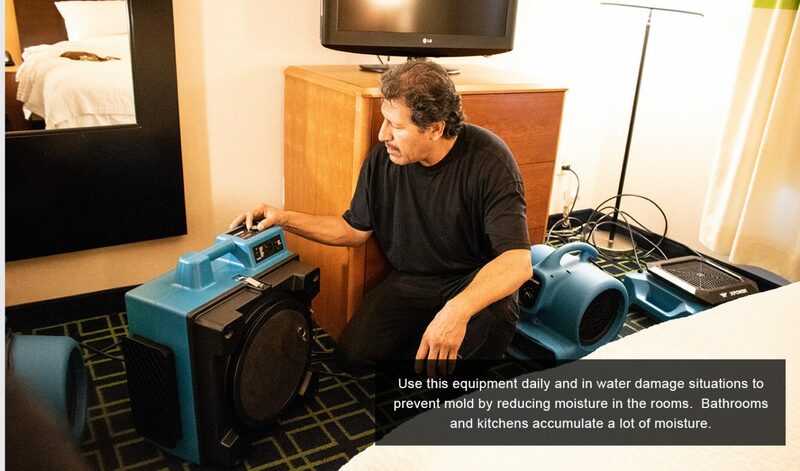 A proper mixture of air movement and dehumidification is necessary to prevent secondary damage. Airborne contaminants can be spread by natural circulation, or by using air moving equipment. 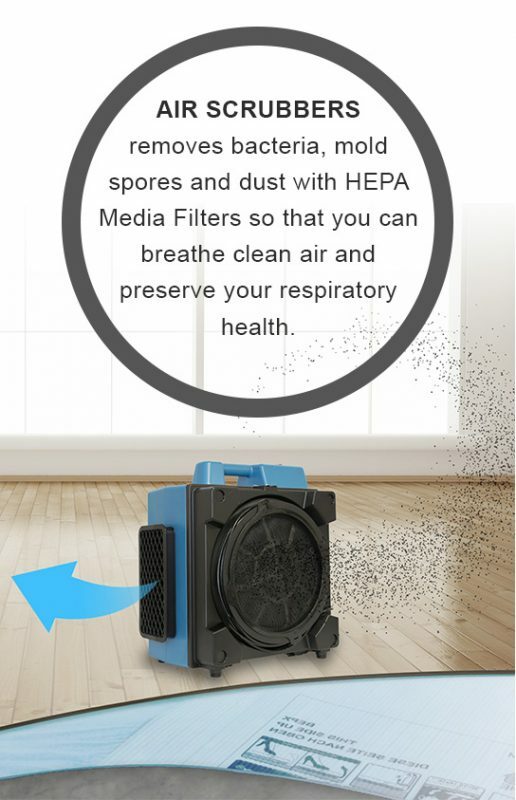 The air purification process is when 99.97% of large and mirco particulates, as small as 3 microns are, are removed utilizing commercial grade air scrubbers equipped with HEPA Media Filters.Capturing these contaminants which includes mold spores and other allergens, is essential to preserve your and your guest’s respiratory health. Place the air scrubber near the vent or wall where the odor is most concentrated. Ongoing inspection and monitoring ensures that all walls, corners and cavities are drying properly. TIME IS YOUR ENEMY – ORDER TODAY!